When it comes to on-page SEO techniques, you must have heard a lot about the Meta tag and Meta description. But On-Page SEO techniques are much more than just Meta tag and description. In this comprehensive guide to on-page SEO techniques, I will take you through all the in and out of on-page SEO optimization techniques. 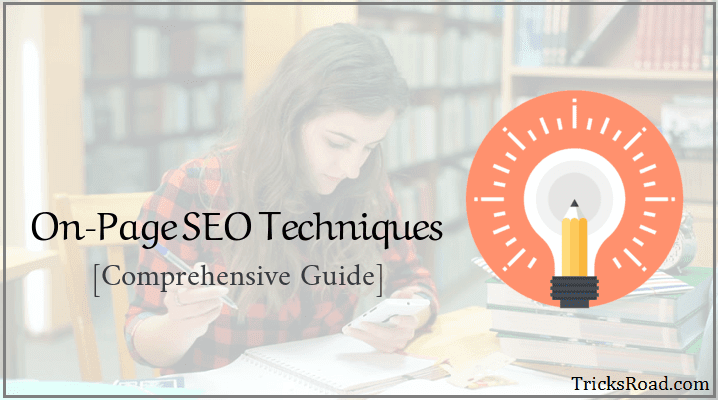 In this on-page SEO guide, you will also see some practical strategies to On-Page SEO Checklist and optimization techniques. If you follow this on-page SEO guide thoroughly together with Off-Page SEO, then you will see some good ranking in SEO of your keywords. Let’s start with this detailed on-page SEO checklist. Just follow these on-page SEO techniques and make your blog post completely optimized for on-page SEO. Before starting with any blog post, chose one main keyword for which you mainly want your article to rank. You should also select some LSI keyword as well. The title is one of the most important on-page SEO factors and must contain your primary keyword. Tips: It is not always necessary to start the title with your main keyword, but it must be in your first 65 characters. The sooner it will be, the better it is considered. URL is another important on-page SEO factors. You must use your primary keyword in the URL. If you are using long URL also, make sure your main keyword is in the first 3-5 words. But I would suggest avoiding very long URL. Here you can see the best practice for SEO friendly URL. If you are using dates in the URL then, use the keyword after that, and it won’t effect. Your URL should be short and meaningful to make sure SEO friendly. Your blog post’s main title must be in H1 tag. Google consider the heading tags (all H1 to H6) while ranking and so you must use these very efficiently. Usually, most of the themes and templates already use the main title in H1 tag, but there are many themes which don’t (e.g. Masala Template for Blogger). You can use inspect element and check your blog post main title is in which tag like below. If it is in H1, then you are good else change it to H1 from the CSS or HTML editor. Tip: You should also make sure that there is only one H1 tag on one page and contains the main keyword. If there is any another keyword, make sure to change it to another heading tag. Many times, you will find some plugins also using H1 tag to increase the font, and you should check the code and act accordingly. After the H1 tag, H2 tag values a lot in search engine ranking. You should include sub-heading in the H2 tags. It is advisable to use your primary keyword at least once in any H2 tag as well. Tip: It is not required to keep the keyword at the start of the H2 tag, but there should be in the H2 tag anywhere. It’s well said that a visual speaks much more than the words. It is true also. • Most important, it increases the average time per user and decreases the bounce rate. 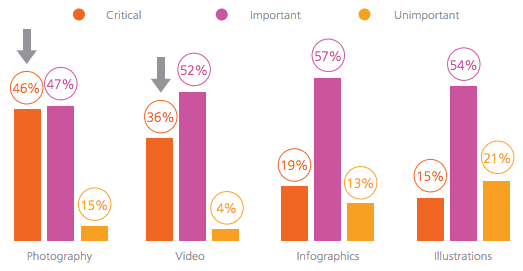 As per the study by Inbound, around 46% of marketers say photography is critical to their current marketing and storytelling strategies. It is recommended to use the focus keyword in the first 100-150 words of your article. Algorithm says that it is good to clear the motive of your post and so keyword should be in first Para. Tip: Usually sometimes bloggers write the introduction first and then start with the main topic and so forget to place the keyword in the first paragraph. But you should drop your keyword in the first 100-150 words for a better result. SEO has changed a lot! Earlier mainly people used to search with the small keywords like “Hosting Services”, but with the advancement, long tail keywords have come in existence and so you should focus on log tail keywords. Apart from focusing on long tail keywords, you should also add modifiers in your title. • Top 10 Hosting services etc. So it is recommended to use the modifiers like “Top”, “Best”, “Year in the Title”, “Guide”, “Review” etc. 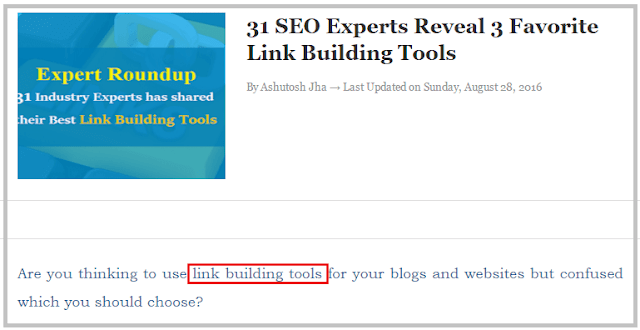 I have written a detailed guide on Blog post interlinking. In this guide, I have explained all the aspect of using internal links. You should link your other pages in the new page as and when you find it relevant. You can consider this post as an example to see how many times I have linked my other pages. It doesn’t only help in SEO but also it increase the average page view, and average time visitors are on the website: Both are again significant SEO factors. Tip: I recommend playing the safe game here and using the internal links as and when required. Although Wikipedia has 50+ links in almost all the pages, they are the big player. On the safer side, you should use 4-5 links of an older post whenever possible in 1000-1200 words article. Using outbound links in blog posts shows that your site contains quality information and Google will prefer your content as well. But make a sure you link to only authority sites. Authority sites can be Wikipedia, product site or the well-established and popular sites in your niches. Tip: It is recommended to use 2-3 external links per 1000-1200 words of the article. But make sure to link only high-quality and relevant sites else it may harm as well. Since the time users have started using mobile devices majorly to browse, responsiveness has become one of the major on-page SEO factors. Your website should work smoothly and provide a great user experience on all the devices. 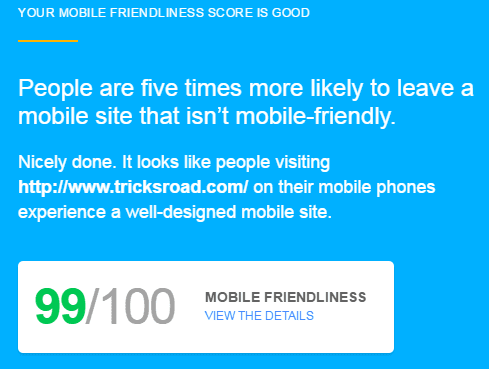 You can use Google Official responsiveness checker to test the responsiveness of your site. There are several other tools also available through which you can check the responsiveness of your website. Tip: Here are the 5 points while creating a responsive website. Usually, now themes and templates come as responsive. Loading time is also an important search engine ranking factor, and you should work to reduce blog load time. Ideally, a page load time should not be more than 3 seconds else there is a probability that your user might leave your website. 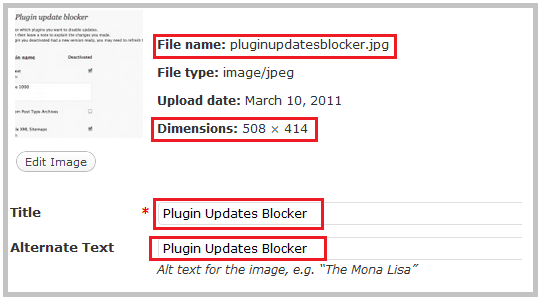 You should read our detailed guide on tips to reduce blog load time. Images are something which contributes the maximum to server response in web page loading time. Before uploading the image to the server and using it in your post, you must optimize it for a better result. There are many tools available for image optimization like TinyPNG etc. which will reduce the picture size without decreasing the quality of the image. Also, use your focus keyword in the Alt tag and make the image name on your keyword name. It will help your image to rank in Google Image search engine which is again one of the major contributors to traffic. Tips: You should check below before using the image. LSI keywords (Latent Semantic Indexing) are keywords that are semantically related to your primary keyword. With such keywords, Google determines the page relevancy and so you should use them. If you are writing long content, then you must use at least 2-3 LSI keywords so that you can rank for those as well together with your main keyword. The simple way to find the LSI keyword is, just search your main keyword in Google and scroll to the bottom and check the related search. Now just use two-three keywords from these in your blog post. Content length together with the quality is also considered as one of the important factors for on-page SEO. You should write lengthy content but of good quality. It should not like you are writing 2000-3000 words of the post but of zero relevance. You must write a detailed post with relevant information so that users won’t be able to leave your site soon. 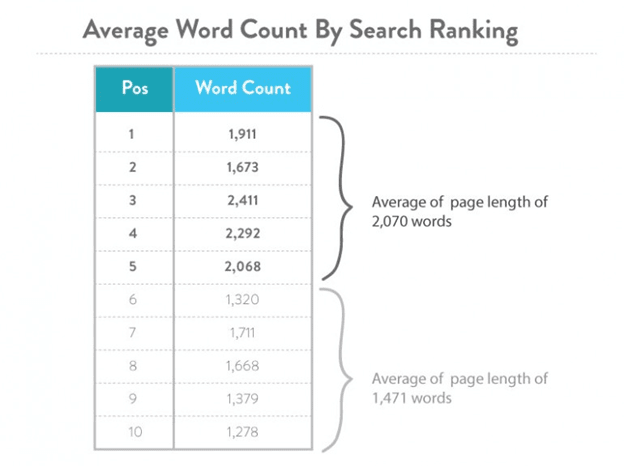 Here is a chart showing how the lengthy content performs in the search engine. Remember this is not a formula, but a long content has been seen performing better in the search result. Tip: Try to write your main articles of more than 1200 words at least to play it better in the search engine. Neil Patel has explained in this interview, how he use to write the content of 3k+ words regularly. Social Media also plays a significant role in ranking as it tells the search engine that people love the content and so it is relevant information. 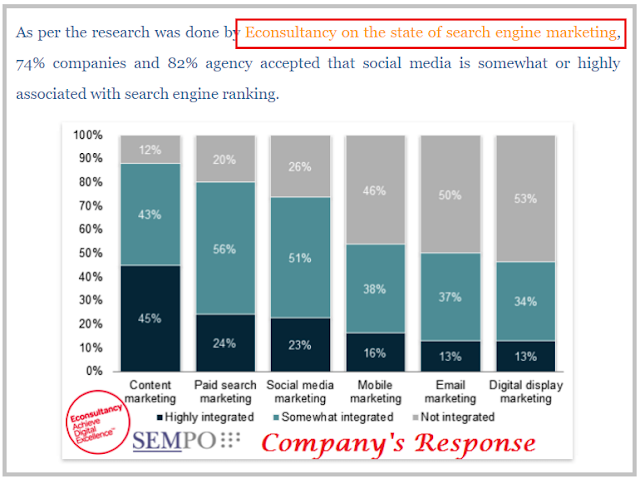 Although it doesn’t impact directly on the ranking, you must not ignore it. To get social sharing, you can use some sharing button on the site so that your readers can share the post if they like. • Target search phrase is repeated three to 10 times within body copy depending on the content length. Better keeps it between 1-3% including LSI and Semantic keywords to avoid any penalty. • No misspellings or poor grammar. To make sure this you can use any of these free online proofreading tools. • Use Quality content and should do a detailed content analysis to ensure it is of high quality. Bonus: You can also download our complete on-page SEO checklist to make sure whenever you write a new blog post; it will be perfectly on-page SEO optimized. This was all about On-Page SEO Techniques. Hope you enjoyed this on-page SEO guide, and I am sure if you follow these on-page SEO techniques, you will be able to create a perfectly on-page optimized content. Will love to hear your opinion on this! !